Brunnthal/Munich, Germany, May 4, 2017 – SFC Energy, a leading provider of hybrid power solutions to the stationary and mobile power generation markets, announces an exclusive new defense industry sales partnership with ZeroAlpha Solutions Ltd., Cardiff, UK, a leading supplier of networking hardware, software and sustainable power solutions to the UK and European defense and security markets. With their excellent track record as a communications and power systems integrator for the UK defense and security industry, ZeroAlpha Solutions will sell and customize SFC Energy’s portfolio of defence and security power products to meet the specific off-grid power requirements of UK customers in those industries. 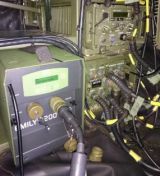 In partnership with ZeroAlpha Solutions, SFC’s range of defense products were selected to undergo extensive field trials by the UK MoD under both the Army Warfighting Experiment and Information Warrior exercises. With an objective of providing sustainable and tactical power at the tactical edge the fuel cells successfully provided extended silent watch capability and enhanced mission endurance to both vehicle and dismounted applications. Additional information on the EFOY Pro fuel cell and on SFC Energy’s off grid power portfolio for security & safety, oil & gas, wind, traffic management, environmental and telecommunications applications at www.sfc-defense.com, www.efoy-pro.com and at www.sfc.com. More information on ZeroAlpha Solutions at www.zeroalphasolutions.com. ZeroAlpha Solutions provides networked Command, Control, Communications, Computers, Intelligence, Surveillance and Reconnaissance (C4ISR) and sustainable power solutions to the UK defence and security markets. With over 60 years of defence communications experience, the company’s focused on addressing the growth in the military shift towards network centric warfare and the requirement for new and innovative hardware and systems solutions to support deployed operations.